The Rachael Ray Hard Anodized Cookware Set is a great value. It contains the everyday pots and pans you need – and will actually use – including saucepans, a saute pan, two skillets and a stock pot. 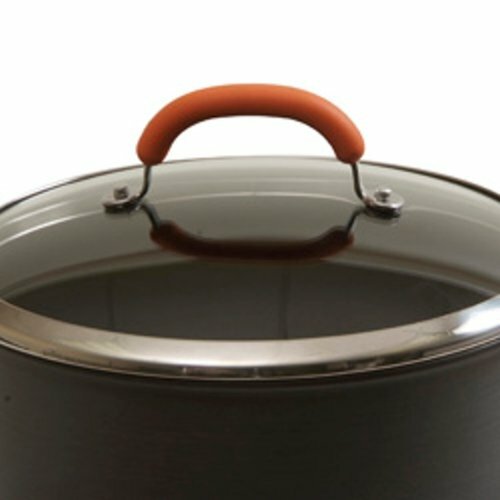 The nonstick cookware is attractive with a dark gray outer color and stainless steel handles that are covered with orange silicone for safe handling while cooking. Not only is this Rachael Ray Cookware Set functional, but it’s pretty much guaranteed to put a smile on your face with its attractive design and colors. Read the first of my Rachael Ray Cookware reviews to find out what I discovered about the Hard Anodized II Nonstick 10 Piece Cookware Set. The Rachael Ray Hard Anodized 10 Piece Cookware Set is made of a hard anodized aluminum core with a nonstick interior finish. 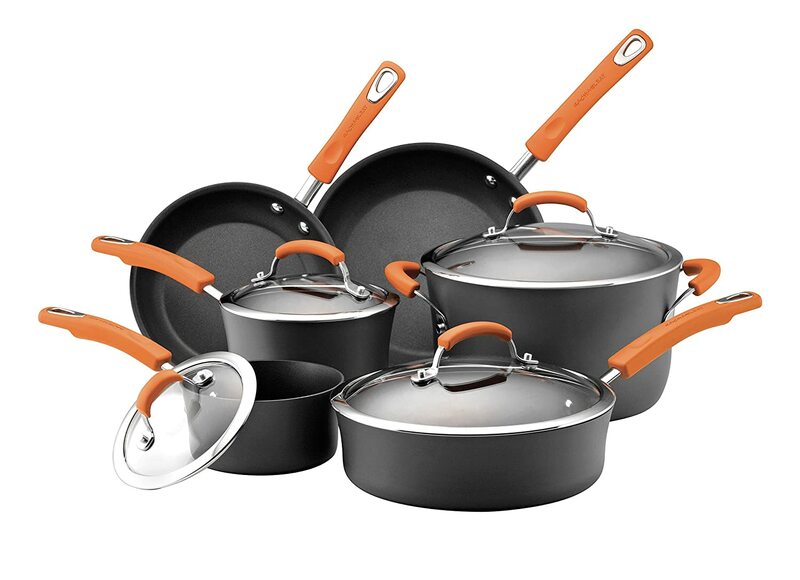 One consumer remarked that the set’s hard anodized finish and nonstick coating don’t appear to have the same quality as other sets (such as Calphalon). The Rachael Ray Hard Anodized Cookware is an attractive, neutral dark gray color. The orange handles give the set a nice shot of fun color. Some consumers commented that the set is pretty light weight and doesn’t feel as sturdy as some other cookware sets. I really love the large saute pan that comes with the Rachael Ray Hard Anodized Cookware set. You can use it for so many things, and it really comes in handy for making one dish meals that wouldn’t fit into a regular sized saute pan. The only thing this pan is missing is a “helper handle” which can help when there is a lot of food in the pan and it gets heavy (particarly when putting in and removing from the oven). 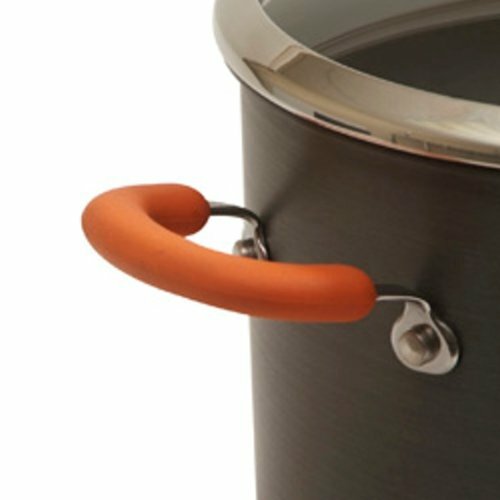 The handles are stainless steel and covered with rubberized orange. Not only does this give the cookware set a shot of color, but it makes the handles easy to grip during cooking. We’re all curious to see how our cooking is coming along. With tempered glass lids, you can see your food while it’s cooking without having to pick up the lid, which allows moisture and heat to escape. Sealing moisture and heat in while cooking makes food healthier and it tastes better, too! The Rachael Ray Hard Anodized II 10 Piece Cookware Set is oven safe up to 350° F. Always be sure to use oven mitts while handling pots and pans that have been in the oven, as even the handles will get hot at these higher temps. Rachael Ray products come with a Lifetime Limited manufacturer’s warranty. Hard anodized aluminum is known for it’s durability. With proper care, the set should last for several years. You can help to extend the life of the Rachael Ray Hard Anodized Cookware by always using plastic utensils and never using high heat. These two things can help to preserve the non-stick finish and keep your set useful for many years. This Rachael Ray 10 Piece Cookware Set is dishwasher safe; however, I always recommend hand washing to get the most life out of any cookware set. Over time, harsh dishwasher detergent can scratch up surfaces and affect the nonstick finish. After reading several reviews of the Rachael Ray Hard Anodized Cookware set, I can confidently say that most customers are really happy with it. Several reviewers on Amazon gave hearty recommendations for the pots and pans, with one consumer stating that she would recommend them to everyone, and another stating that the Rachael Ray set beat their Calphalon by a mile. Reviewers seemed to really like the appearance of the set. Some of the comments regarding the looks of the set were: “modern”, “attractive”, “stylish lines” and “eye appealing”. Several users commented on the weight, stating that the set has a nice weight to it. Only one customer reviewer (that I found) felt the weight could be a bit heavier. Many reviewers talked about the non-stick surface and that nothing sticks to this set. It’s also easy to clean and food can be “wiped right off”. The orange handles got quite a bit of praise, as well. Not only do they nicely contrast with the dark surface of the Rachael Ray cookware, but the silicone coated handles do stay cool to the touch when in use. Overall, this set sounds like the perfect solution for someone looking for a good basic cookware set. It contains useful pieces that you’re likely to use on a regular basis. It would make a great gift for a college age/student out on their own, or as a wedding gift for the new bride and groom.